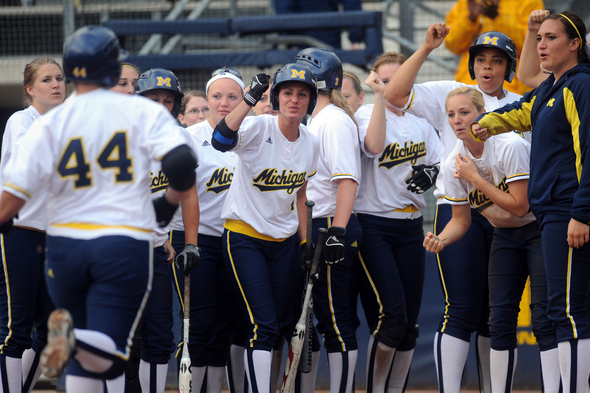 Posted on Thu, Apr 22, 2010 : 3:06 p.m.
Michigan players come out of the dugout to congratulate Nikki Nemitz after she hit a three-run homer in the first inning of the second game of a double header against Penn State at Alumni Field on Wednesday. It started as a joke. Michigan’s softball players wanted to watch the men’s NCAA basketball tournament. Their coach, Carol Hutchins, and her staff wanted to watch the women’s tournament. On the bus during a road trip to start the season they reached a compromise - Connecticut. "So we were on the bus watching women's basketball and we were like 'OK, can we change the channel,'" junior first baseman Dorian Shaw said. "But when you're watching UConn, it's like they have no gender. They are just playing basketball. They are just doing things that you just don't believe anybody will be able to do. "When we are watching them, it's fine." In watching UConn, Michigan also found something else - a comparison. “It did come out of the fact that we were following it during the NCAA tournament about the time we were exploding,” Hutchins said. “We just said ‘Hey, what makes them?’ We kind of analyzed them one day and the kids pointed out, I said they play well together. Connecticut’s women’s basketball team has won 78 games in a row - just one by less than double digits. They haven’t lost in more than two seasons. So far, Michigan’s softball team - 35-5 and No. 2 in the country - currently has been close to Connecticut levels. Behind pitchers Nikki Nemitz and Jordan Taylor, they have six shutouts in their last seven games. They have won 9 of their last 12 games by the eight-run mercy rule. The Wolverines haven’t lost since March 20 and are 28-1 in March and April. As of Monday, Michigan was in the Top 5 nationally in scoring (fifth at 7.29 runs per game) and earned run average (fourth 1.46). After two 8-0 shutouts against Penn State on Wednesday, those Connecticut-like numbers will be even better. The UConn comparison helped Michigan stay focused. Hutchins preaches about the “process” - how to approach teams and games - rather than wins. And her team bought it. “It’s not too tough,” sophomore outfielder Bree Evans said. “Sometimes we really have to think about it but we’re pretty focused on it and we know it and we have it stuck in our head right now. The belief came during a trip to Fullerton, Calif. during the middle of March during the traditionally-tough Judi Garman Classic. On the second day, Michigan faced UNLV. The Wolverines trailed 13-8 after four innings. They appeared headed to a loss. Except something changed. Michigan focused. They verbally committed to winning the game. They won 14-13 behind a five-run fifth inning and it started the Wolverines current ascent. “We made a decision and that’s when we realized it was different. We just decided. That’s something that we’ve done,” Shaw said. “At the beginning of the year we decided we wanted to go to the World Series. We decided we wanted to win a Big Ten championship. This attitude -- described by pitching coach Jen Brundage as “relentless” - is what Connecticut has. Thinking like that is something she has tried to impart onto her players. She has. Taylor said the second perfect game of her career on Wednesday was, in part, due to how she approached hitters aggressively. At the plate, Michigan’s batters don’t worry because everyone in their lineup can hit. It even led Hutchins, who has coached Michigan for 26 seasons, to say what is happening with this year’s Wolverines now is unlike anything she’s experienced before. Yet if her team gets too confident, all she has to do is point to the basketball tournament her players prefer - the men’s tournament. “We knew we had talent and we knew we had good pitching,” Hutchins said. “Watching them jell together here, I’ve had a lot of special teams. This isn’t the only one, this isn’t the second one. I’ve had a lot of special teams. You get kids who come to Michigan, who really play for Michigan. Do that and Michigan has a shot to do what Connecticut did earlier this month - finish its dominance with a national title. Michael Rothstein covers University of Michigan sports for AnnArbor.com. He can be reached at (734) 623-2558, by e-mail at michaelrothstein@annarbor.com or follow along on Twitter @mikerothstein.